Rohde & Schwarz showcased the monitoring of the battery life of wireless devices at the GSMA Mobile World Congress 2017 in Barcelona. Rohde & Schwarz mobile network testing presented QualiPoc Android, a smartphone-based product for optimizing mobile networks, at the GSMA Mobile World Congress 2017 in Barcelona. This video explains the basic principle of direct discovery: how a device sends (announces) and receives (monitors) a discovery message on the uplink frequency using defined resource pools. This video demonstrates protocol analysis for direct discovery based on the R&S®CMW500 wideband radio communication tester. Rohde & Schwarz demonstrated the first conformance test cases for LTE-Advanced carrier aggregation in a licensed and unlicensed spectrum at the GSMA Mobile World Congress 2016 in Barcelona. SwissQual, a Rohde & Schwarz company, presented NQDI II, the new post processing software to turn drive test data into smart insights, at the GSMA Mobile World Congress 2016 in Barcelona. SwissQual, a Rohde & Schwarz company, presented the Diversity Benchmarker II at the GSMA Mobile World Congress 2016 in Barcelona. SwissQual, a Rohde & Schwarz company, presented SmartMonitor, a web-based software for realtime service quality monitoring, at the GSMA Mobile World Congress 2016 in Barcelona. Rohde & Schwarz showcased full reference video testing based on the R&S®VTC/VTE/VTS video tester family at the GSMA Mobile World Congress 2016 in Barcelona. Rohde & Schwarz presented end-to-end data testing of an LTE-Advanced-enabled mobile device capable of 1 Gbps data throughput in the downlink (DL) at the GSMA Mobile World Congress 2016 in Barcelona. Rohde & Schwarz showcased optical video experience testing with a barcode scanner at the GSMA Mobile World Congress 2016 in Barcelona. The R&S®CMW500 wideband radio communication tester with the graphical user interface R&S®CMWcards offers the most convenient solution for coexistence testing on UEs supporting LTE-U CSAT. This video explains the LTE-U technology and demonstrates how to efficiently measure LTE signals in the 5 GHz unlicensed band on eNodeBs using the R&S®SMW200A vector signal generator and the R&S®FSW signal and spectrum analyzer from Rohde & Schwarz. The automatic channel detection (ACD) feature of the R&S®ROMES drive test software together with the R&S®TSMA, R&S®TSME or R&S®TSMW drive test scanners from Rohde & Schwarz makes drive tests more efficient. It demonstrates comprehensive test solutions for mobile devices and how to optimize deployed networks to get them ready for LTE multicast. Rohde & Schwarz presented the industry’s first mobile radio tester supporting four component carriers (4CC) in the downlink at the GSMA Mobile World Congress 2015 in Barcelona. Rohde & Schwarz presented LTE-Advanced RF tests with mixed duplex modes referred to as FDD/TDD joint operation at the GSMA Mobile World Congress 2015 in Barcelona. Rohde & Schwarz introduced eMBMS user experience and performance testing with its own independent mini-service layer, implemented in the R&S®CMW500 wideband radio communication tester, at the GSMA Mobile World Congress 2015 in Barcelona. Rohde & Schwarz presented the fully integrated IMS server infrastructure with reliable test conditions within the R&S®CMW500 wideband radio communication tester at the GSMA Mobile World Congress 2015 in Barcelona. Rohde & Schwarz demonstrated the first LTE-Advanced test cases for carrier aggregation downlink with 3 component carriers (3CC) at the GSMA Mobile World Congress 2015 in Barcelona. Rohde & Schwarz demonstrated their complete location based services test coverage from R&D to conformance and carrier acceptance at the GSMA Mobile World Congress 2015 in Barcelona. Rohde & Schwarz presented the R&S®VTC/VTE/VTS video tester family at the GSMA Mobile World Congress 2015 in Barcelona. Internal triggering to separate TD-LTE uplink and downlink spectrum is now available with the R&S®FSH handheld spectrum analyzer from Rohde & Schwarz, demonstrated at the GSMA Mobile World Congress 2015 in Barcelona. This webinar discusses the added features, analyzes design implications and explains how to overcome these challenges. This webinar discusses the associated test and measurement aspects and challenges that have been identified, and demonstrates initial measurement solutions. This video demonstrates automatic channel detection (ACD) for LTE using the R&S®ROMES drive test software together with the R&S®TSME or R&S®TSMW drive test scanner from Rohde & Schwarz. This solution is ideal for mobile network optimization and benchmarking. Rohde & Schwarz presented end-to-end tests on Cat6 devices for LTE-Advanced (FDD and TDD) using the R&S®CMW500 wideband radio communication tester at the GSMA Mobile World Congress 2014 in Barcelona. World’s first high-power user equipment (HPUE) testing has been demonstrated by Rohde & Schwarz and Elektrobit at the GSMA Mobile World Congress 2014 in Barcelona. Rohde & Schwarz demonstrated the worldwide first LTE-Advanced test cases for enhanced intercell interference coordination (eICIC) and enhanced downlink MIMO (TM9) at the GSMA Mobile World Congress 2014 in Barcelona. Rohde & Schwarz presented the most compact conformance test system for location based services at the GSMA Mobile World Congress 2014 in Barcelona. Rohde & Schwarz showcased a compact LTE 4x4 MIMO test solution at the GSMA Mobile World Congress 2014 in Barcelona. Testing LTE-Advanced carrier aggregation in the field is now available with the R&S®FSH handheld spectrum analyzer from Rohde & Schwarz, demonstrated at the GSMA Mobile World Congress 2014 in Barcelona. This webinar provides an overview of the Wi-Fi traffic offload in LTE as standardized by 3GPP. In the third part of the Rohde & Schwarz webinar series on LTE UE RF measurements, we will discuss the details of carrier aggregation, its different types and its impact on how to test a device that supports carrier aggregation. Rohde & Schwarz demonstrated the most compact solution for LTE-Advanced 2x2 MIMO testing at the GSMA Mobile World Congress 2013 in Barcelona. 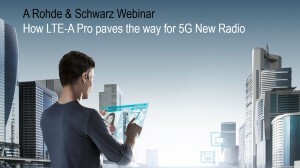 Rohde & Schwarz presented world’s first RF test system for LTE-Advanced carrier aggregation conformance tests at the GSMA Mobile World Congress 2013 in Barcelona. Rohde & Schwarz demonstrated LTE-Advanced protocol testing with the R&S®CMW500 wideband radio communication tester at the GSMA Mobile World Congress 2013 in Barcelona. Rohde & Schwarz is first to offer a one box test solution for LTE-Advanced (FDD) carrier aggregation with 2x2 MIMO in downlink on the R&S®CMW500 wideband radio communication tester. This webinar provides an overview of new developments in the design of mobile radio base stations. When it comes to LTE/LTE-A modem development, achieving standard compliance is a key requirement. Planning for an integrated verification and testing flow from concept to implementation is mandatory to avoid late-minute surprises. Rohde & Schwarz demonstrated 2x2 LTE MIMO transmitter signal analysis with one R&S®RTO digital oscilloscopes at the European Microwave Week 2012. The webinar focuses on the radiated approach, which takes arbitrary angles of arrival (AoAs) for the MIMO streams into account and provides sufficient control over the AoAs in 3D. Mobility is an essential part of LTE technology due to LTE’s initial hotspot deployment. Rohde & Schwarz demonstrated a real time 3GPP Release 10 LTE-Advanced downlink scenario at the GSMA Mobile World Congress 2012 in Barcelona. Presentation of the R&S®TS8980 test system for testing the quality of video applications on LTE user equipment under realistic RF conditions at GSMA MWC 2012. At the GSMA Mobile World Congress 2012 in Barcelona, Rohde & Schwarz demonstrated MIMO drive test measurements in LTE networks. The R&S®TS8980LBS covers A-GNSS (GPS and Glonass) LTE minimum performance standards according to 3GPP 37.571-1 and location based services (LBS) test plans defined by major network operators around the world. LTE Release 9 adds several new features to LTE, such as evolved MBMS (eMBMS), dual-layer beamforming (transmission mode 8) and positioning support. Commercial LTE Release 8 networks have been launched worldwide. The features of 3GPP Release 9 further enhance LTE, and first implementations are now being designed. LTE is reality. Today, more than 17 networks using different frequency bands and bandwidths are in operation in various countries. First LTE FDD networks have been already launched. Webinar: Does Your LTE Network Meet the Expectations? First commercial LTE networks have been launched and many more are expected to follow in near future. Webinar: Make Your LTE Call Now! LTE (long term evolution) is an advanced and complex technology that uses two different transmission schemes in the downlink and the uplink. LTE is standardized by the 3rd Generation Partnership Project (3GPP).